When a cheer or an extra dose of Auburn spirit is needed at the College of Veterinary Medicine, Pete Velotas is the man to call. Velotas, a fourth-year veterinary student and Birmingham native, is a former member of the Auburn University Cheerleading squad. Velotas got his start in both of his passions during high school. At the same time, Velotas said he wasn’t sure what he wanted to study in college. An English class assignment required students write a research paper on a profession of their choosing. Velotas, who had always loved animals, decided to write about being a veterinarian. “It was funny because I was interviewing Dr. Andy Sokol, ’93, at Caldwell Mill Animal Clinic in Birmingham, about being a veterinarian. He said to me ‘Every veterinarian I ever met got their start working in the kennels.’ He then slid an application across the desk to me,” Velotas said. Velotas soon began working the kennels at Caldwell Mill, and while learning technician and other veterinary skills, decided that veterinary medicine was what he wanted to do. After coming to Auburn, Velotas majored in zoology, and decided that he also wanted to be a cheerleader for the Tigers. Velotas admits he wasn’t successful at first. “The first year I tried out, I didn’t get accepted. Looking back, I think my interview hurt me more than anything. I wanted it so bad that I couldn’t stomach the thought of not getting in, and it really hurt my interview,” Velotas said. Velotas, more confident and determined, was selected the next year, and cheered for both his junior and senior years, 2009-10 and 2010-11, respectively. Velotas had the honor of being part of the team when Auburn won the 2010 national championship, earning national championship rings along with the football team. Velotas (right), with Dr. Andy Sokol after receiving his white coat. The skills he acquired in cheerleading have proven useful as during his time at the College of Veterinary Medicine. “Communication is a big thing in cheering,” he said. “You’ve got to be comfortable talking to people in a way that fits the situation, whether it’s talking to a class of kindergarteners, donors giving big sums of money to the university, or in a stadium with more than 80,000 screaming fans. Velotas said that his squad mates also gave him a greater ability and appreciation for working with people of diverse backgrounds and interests, as represented in the many different majors in the squad. Velotas credits veterinary medicine alumni Drs. Sokol, Bill Christenberry, ’86, and Jimmy Jordan, ’87, with mentoring and encouraging him in veterinary medicine and a love and devotion to Auburn University and the War Eagle spirit. Velotas said he’s trying to carry forward the tradition set by his mentors: Dr. Jordan was an Auburn cheerleader, and Dr. Sokol is a friend of Aubie. Velotas said he’s proud to be part of a great tradition and, what he believes, to be the best university in the country..
“My time cheering taught me about the value of communication, and the value of diversity,” Velotas said. “It’s a testament to Auburn that students who are so different in their majors and backgrounds can unite, whether it’s cheering or veterinary medicine. 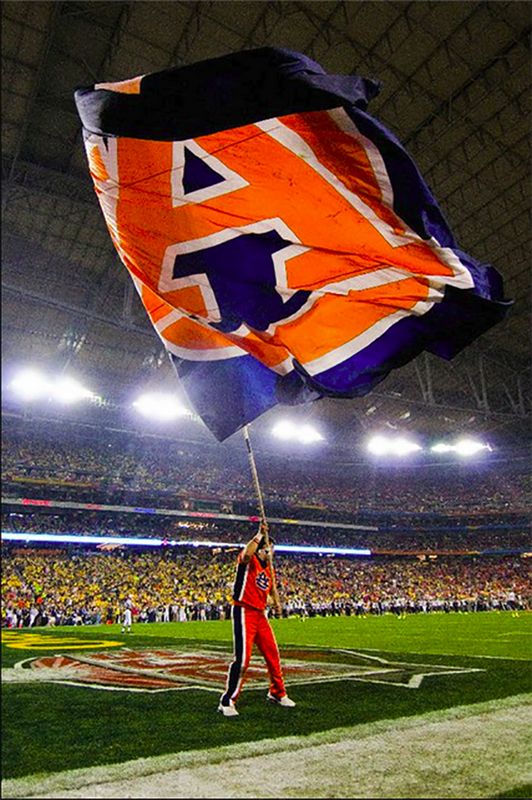 Velotas hoists the Auburn flag during the 2010 National Championship game.